This is one of my go- to recipes for the middle of the week when you are after a satisfying yet lighter meal so I know you’ll love it too! If there is one thing I can’t resist it’s a good old mushroom! Any variety keeps me happy however porcini keeps me very happy! In the UK you can pick up some decent dried mushrooms so I have used these here. You can use porcini by itself or a mixed selection of wild dried mushrooms if you can get them. The delicate earthiness of the mushroom weighs up the mouthwatering saltiness of the pancetta beautifully. 1. Before anything else you need to rehydrate the mushrooms by soaking them in warm water. This usually takes around 10 minutes andthe mushrooms should feel soft when they are ready. Try and buy the best quality mushrooms you can and you really well tell the difference; your after decent sized pieces rather than mushroom dust! 2. Get a small non- stick pan and fry the pancetta cubes over a medium heat until they begin to turn golden. I don’t add any extra butter or oil to fry these as the natural fats do the trick. Remove the pancetta from the pan and blot on kitchen towel. 3. For the next stage you need a medium sized pan and melt 30g of the butter over a moderate heat. Add the garlic and snip the chilli into the pan and cook for 2 minutes. As a self- confessed chilli lover I think there is a time and place for dried chilli and this is one of them. Remember that dried chillies also contain seeds so remove them if you prefer a milder heat. 4. Quarter the tomatoes (or into sixths if they are larger) and add to the pan with the chilli and garlic. Simmer over a low heat for 10 minutes so that they tomatoes begin to reduce down and create a sauce. I then add the pancetta, softened mushrooms and the torn basil back into the pan and simmer for another 15 minutes. I add some of the basil at this stage and save the rest to serve so it doesn’t disappear to nothing or go bitter. The sauce should be chunky and thick so that it coats the pasta. 5. Cook the pasta as per the cooking instructions and drain well. Add the remaining butter to the pasta and stir so each piece is coated. Combine the pasta and sauce and then it’s ready to go! Tear over a little extra basil and offer parmesan alongside. Using the best parmesan you can afford adds a little touch of luxury. Porcini and pancetta- a perfectly moreish combination! 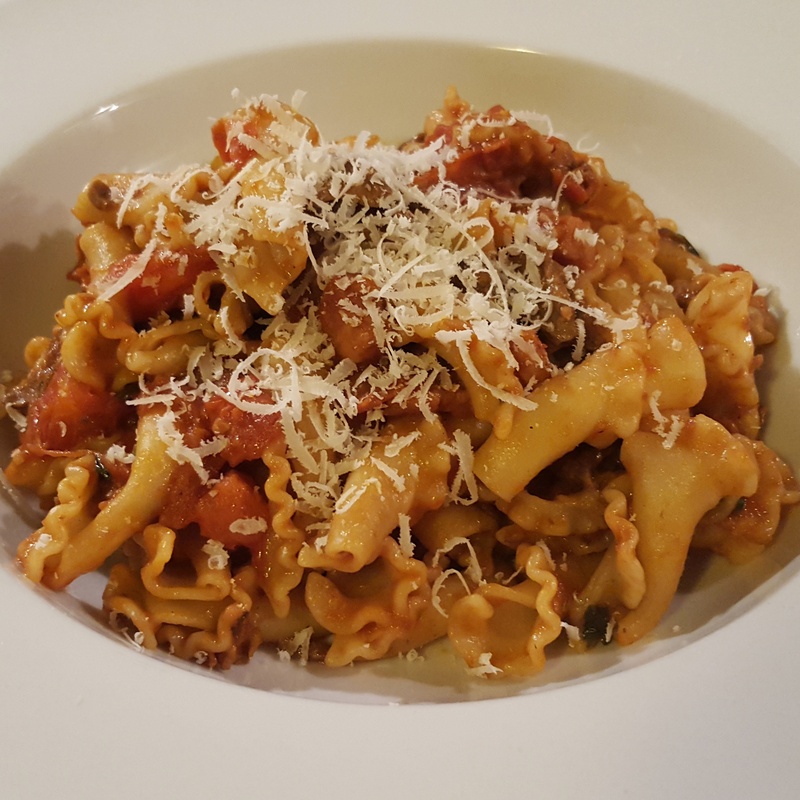 This entry was posted in Recipes and tagged chilli, garlic, gigli, pancetta, pasta, penne, porcini, wild mushroom by sotiris14. Bookmark the permalink.